Planning a wedding and choosing a wedding reception venue can be very overwhelming. There are many things to consider when choosing the “right” place to host the reception of your dreams, that you can afford and that your guests will love! When planning the reception of your dreams, you want to make sure you stay within your budget, research reviews and visit each venue on your list. Compare the costs of each venue to what you are getting for your money. This will in fact be the best day of your life! 1. Are there any catering restrictions? 2. Is the venue convenient for the guests? 3. Does the venue fit into your budget? 4. Are there any restrictions? Vito’s invites you to consider our scenic farm in South Windsor for your wedding reception. With our fabulous cuisine and attentive staff, our farm is one of Hartford County’s most sought after special event venues. We will make your special day, a day you will never forget! From fresh picked flowers and fresh vegetables from our farm to the entire reception set up, DJs, Bands and everything in between, you won’t be dissapointed. Choosing the perfect wedding venue is one of the biggest decisions you’ll make! Remember to take some time and enjoy the process! Olio d’ Oliva is Italian for olive oil! Did you know olive oil is good for you? So go ahead and use more of it with your salads and every day cooking! There are some great health benefits to olive oil so go ahead read on and enjoy that olive oil!! Anti-Inflammatory – chronic inflammation can cause serious diseases such as Alzheimer’s, obesity, arthritis, diabetes, cancer, metabolic syndrome and even cardiovascular disease. Olive oil has been proven to help reduce cases of inflammation. There are some studies that show that the antioxidants in olive oil can inhibit some of the proteins in genes that cause inflammation. Protects Against Heart Disease – Heart disease is among the number leading causes of death in the world except for in the Mediterranean! The Mediterranean diet has quite a bit of olive oil in it. When consumed the olive oil helps lower blood pressure and protects against oxidation of LDL particles, which helps prevent heart disease. Pain Relief – Those suffering from rheumatoid arthritis may want to try olive oil to help reduce the pain and suffering. Fights Alzheimer’s Disease – It’s been found in studies that olive oil helps remove plaque from brain cells in mice. Plaque causes Alzheimer’s. Antioxidants – Extra virgin olive oil is a good fatty acid with both vitamin K and E. These help fight off disease and prevent cholesterol build up. 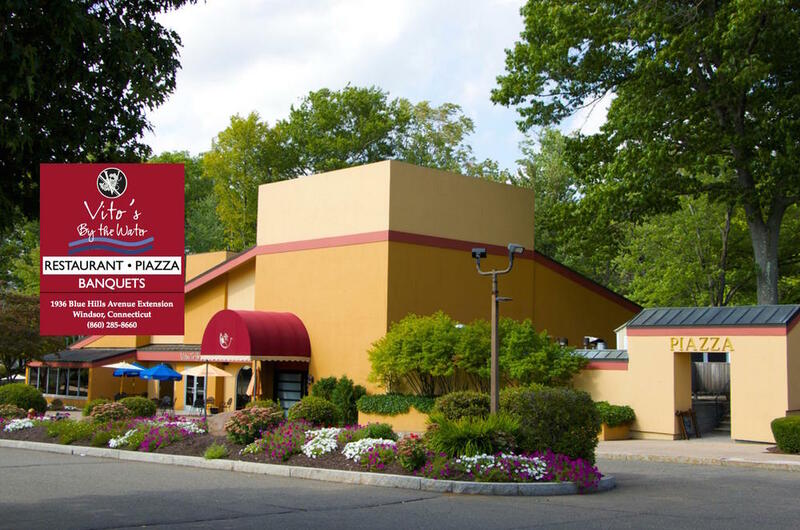 Vito’s Restaurants are family owned and operated since 1978! We take pride in our fresh home-made pastas, pizza dough and desserts but did you know we also love to create craft cocktails? Craft Cocktails are seemingly popular these days but did you know they date back to the Middle Ages? Craft cocktails are a molecular mixology behind the bar that transforms traditional cocktails into super snazzy, taste bud tantalizing, cocktail recipes that will entice your palette and simply have you say “ahhh”! You can enjoy the following fine craft cocktails at V’s Trattoria in Hartford. Be sure to check out our craft cocktails at our other restaurants Vito’s By The Water and Vito’s Restaurant & Pizzaria of Wethersfield. Happy Holidays! The holiday season is full upon us! With all the hustle and bustle, why don’t you take some time out for yourself and enjoy any or all of our Vito’s Restaurants? Relax and let us do the cooking for you! We are a family owned business and we take pride in making our pasta dishes, entrees and desserts from scratch! We are certain you will love our food from the moment you first try our hand-made pasta or desserts! This holiday season we have a couple of amazing offers to help you savor an experience like no other! 2. Purchase $100 worth of gift cards ONLINE by December 24, 2017 and receive a $25 Gift Card FREE! You can purchase gift cards online: https://swipeit.com/product/485/vitos or in any of our restaurants. We wish you all good health and happiness in the New Year! Vito’s loves making, preparing and cooking pasta! Did you know there is a general rule about the shape of pasta and sauce to serve it with? Pasta comes in all different shapes and sizes from long, short, flat, round, stuffed, stars and the list goes on. Pesto sauce is good for long and thin strands of pasta, while tomato sauce goes well with thicker pastas! Cream sauces pair well with thin or small pasta such as angel hair, linguine or penne. Pasta is usually a staple in most homes as well and can be served with tomato, cheese, white and vodka sauces! The combinations are endless! Pasta can be served with an Asian or Indian flare too! Pasta was first referenced all the way back to Sicily in 1154! A noodle made from unleavened dough with wheat flour, water or eggs is formed into shapes, then cooked by boiling or baking. There were both dried and fresh pasta for all to enjoy! Today, many homes now have pasta makers, grocery stores carry fresh pasta and you can buy fresh pasta from Italian markets. Fresh pasta is usually made with eggs and should be eaten fairly soon after it is made. Fresh pasta also takes half the time to cook than dried pasta. Dried pasta is factory produced has a longer shelf life and it’s made out of semolina flour and water. Once cooked the dried pasta expands unlike fresh pasta that doesn’t expand when cooked. Who doesn’t love a good pasta dish made from scratch? Freshly made pasta makes all the difference and Vito’s Restaurants are the place to go for amazing homemade pasta dishes! All of the pastas are made fresh daily, from the finest ingredients! We invite you to come to one of our wonderful dining establishments and taste the difference. Parpardelle Bolognese – Chef Rob’s cutting edge chocolate truffle pasta, Sicilian meat sauce topped with fresh ricotta & citrus gremolade. *As seen on Food Network! or should we say Pizza? No matter how you “slice” it, it’s going to be awesome! Vito’s restaurants pizza dough is made from scratch daily with the freshest of ingredients and is a plethora of cheesy goodness! Exactly where did pizza originate? Modern day pizza is said to have originated in Naples when tomatoes were added to focaccia bread in the late 18th century. It became more popular during World War II when troops stationed in Italy started enjoying and experimenting with this newly found focaccia bread with sauce. In the 1700s through early 1800s, Naples was a thriving waterfront city where the working class had a very tight budget and had to consume food that was easy to make and quick to eat. The Neapolitans experimented with toppings such as anchovies, garlic, tomatoes and cheese on their focaccia bread and well it was all good after that! Pizza became a delicious, nutritious, easy to make food item! In the late 1800s, Queen Margherita took a trip to Naples and as legend has it, she became quite bored with her diet of French food and asked for an assortment of pizzas from a local baker. The queen enjoyed the pizza with basil, tomatoes and mozzarella so much that the story goes, the combination was then named the Margherita Pizza! When immigrants to the United States from Naples arrived in New York and other cities, they were seeking jobs in the manufacturing world. It didn’t take long for the Neapolitans to start making and selling pizza! The first documented pizzeria in the United States was Lombardi’s in Manhattan. It is still in operation today! So the next time you’re thinking of pizza, think Vito’s! We think you’re going to love it! It sells out every year, so make your reservations now to join us for a night of impeccable Scotch and impeccable food. 5 courses of Chef Robert Maffucci’s inventive and delicious “forest-to-table” creations each paired with a specially selected whisky. It all goes down on January 28 at 7:00pm at Vito’s By The Water. $95 per person plus tax and gratuity. Vito’s by the Water in Windsor loves to treat our guests to something special every week. It’s just our way of saying thank you for being part of our family. 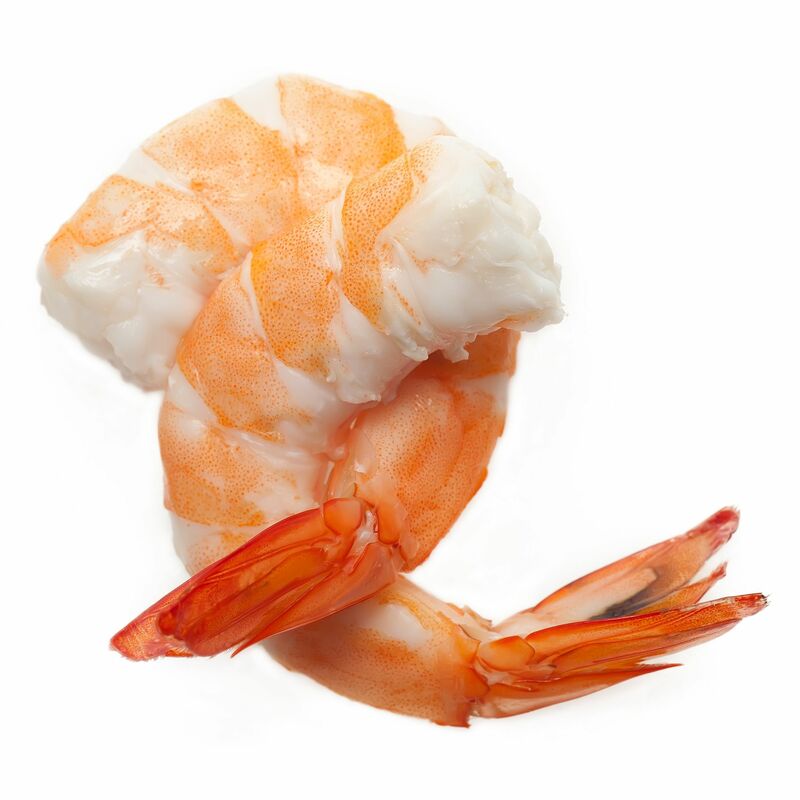 Every Tuesday is $1 cocktail shrimp all day long. As like from open to close all day long. Every Thursday, stop in for $1 oysters (minimum 6) from open until close. Fridays, Saturdays and Sundays we feature a Prix Fixe menu. You and your significant other (or anyone actually) can enjoy 2 appetizers, 2 entrees, 2 desserts AND a bottle of our house wine for the amamzing price of $59.95! Tax and gratuity not included. Vito’s by the Park is a great place to be any day of the week, but we love make things a little more special as our way of saying thanks! Here’s a list of Happy Hours and specials for the week! Every Monday through Friday is our Patio Party by the Park from 2PM – 5PM! Enjoy Happy Hour drink specials, as well as light bites! 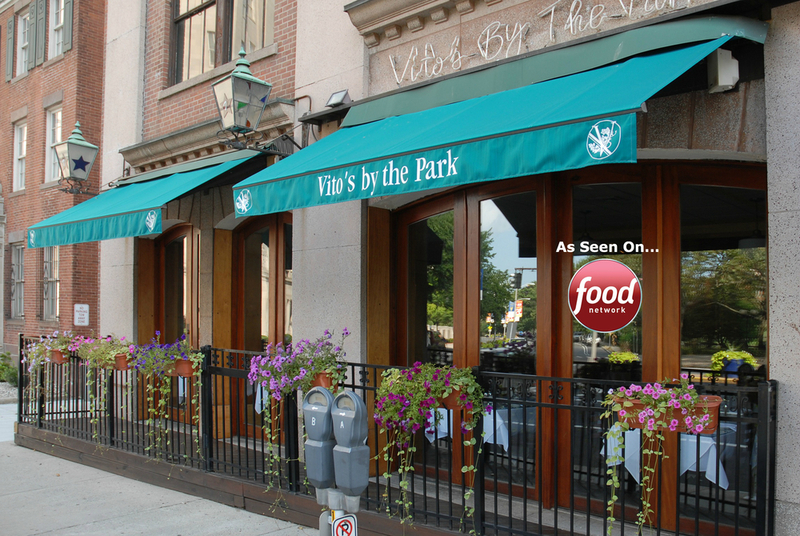 If you love oysters, then you are going to love Vito’s by the Park! 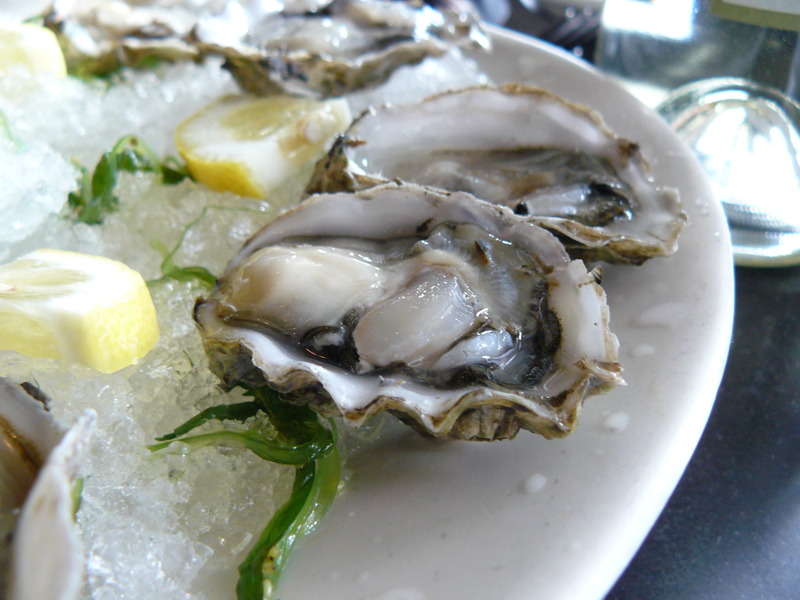 We feature $1 oysters all day long! As in from 11:30AM til 11PM! You do have to order a minimum of 6, however if you are like us, that’s just a start…. Fridays are lots of fun! In addition to the Patio Party, we also feature $1 cocktail shrimp, double points at dinner, and trivia from 8:30 PM til 10 PM! If you love Brunch, then Vito’s by the Park is the place to go all weekend. Our Brunch menu features many of your breakfast favorites, but with a Vito’s twist, as well as appetizers, our incredible raw bar, burgers, our famous sour dough pizza, and much more! 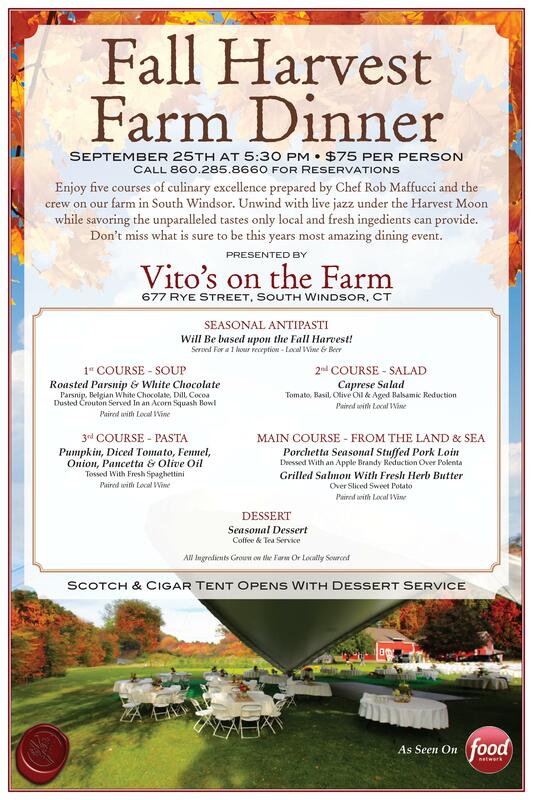 Enjoy five courses of culinary excellence prepared by Chef Rob Maffucci and the crew on our farm in South Windsor. Unwind with live jazz under the Harvest Moon while savoring the unparalleled tastes only local and fresh ingredients can provide. Don’t miss what is sure to be this years most amazing dining event. SEASONAL ANTIPASTI – Will Be based upon the Fall Harvest!